Effective October 1, the yuan will be included by the IMF in an exclusive group of currencies that make up the Special Drawing Rights (SDR) basket, a decision that was announced by the IMF in December 2015. 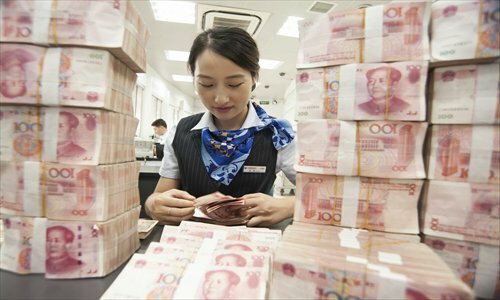 Experts said on Monday that the inclusion will stabilize the yuan and alleviate the currency's weakening trend. The SDR is an international reserve asset created by the IMF to supplement its member countries' official reserves. As of March 2016, 204.1 billion SDRs, equivalent to about $285 billion, had been created and allocated to members, the IMF noted in April. The reserve basket is currently made up of the British pound, Japanese yen, the euro and the US dollar. The yuan will have about an 11 percent weighting in the SDR after its inclusion, according to another IMF statement in April. Zhou Yu, director of the Research Center of International Finance at the Shanghai Academy of Social Sciences, told the Global Times on Monday that after the yuan is included in the SDR, some overseas institutions might increase their holdings of yuan-denominated assets, though some might be reluctant to take such a move under the current circumstances, when the yuan is still in a downward trajectory. "On the whole, the yuan joining the SDR would help stabilize the yuan's exchange rate and help alleviate the currency's depreciation pressure in the short term," Zhou said, but noted that it is unlikely the inclusion would completely reverse the slumping trend of the yuan. Dong Dengxin, director of the Finance and Securities Institute at Wuhan University of Science and Technology, forecast that the yuan being included in the SDR shows that the currency's international status has been uplifted greatly, and this might cause currency speculators, both at home and abroad, to drive up the yuan. "The yuan might appreciate for a short time, but in the long term, the yuan would still depreciate as China's economy hasn't walked out of the shadows of weakness," Dong told the Global Times on Monday, adding that room for such depreciation should be limited, though the bottom is still hard to decide. The yuan's inclusion in the basket comes at a time when the currency is in the midst of a depreciation period. In August 2015, the People's Bank of China (PBC), the country's central bank, adopted a more market-orientated central parity rate system. The reform led the yuan to depreciate by about 2 percent that month and to continue to weaken by a wide margin for the remainder of the year. The yuan dropped roughly 3 percent in 2016. The currency's foreign exchange reference rate against the US dollar was set at 6.6744 on Monday. There's also some market speculation that joining the SDR would compel the yuan to depreciate further. The Economist reported in December 2015 that the IMF's decision may "pave the way for [the yuan's] depreciation," as the PBC would be forced to give the market the last word on the yuan. Zhou noted that after the yuan is included in the SDR, the Chinese government also bears the responsibility to keep the SDR at a stable level. "Therefore, the government wouldn't allow the yuan to fluctuate too much in the short term," he said. Dong stressed that the policies on the yuan's exchange rate is the bottom line of China's national interests. "I think the government would increasingly refer to international practices to manage the currency, but that does not mean it would completely let go," he said. Zhou noted that the yuan's inclusion is beneficial for the currency's internationalization and would facilitate Chinese cross-border trade as settlements using the currency take off. China's foreign trade slumped 1.8 percent year-on-year from January to August to 2.2 trillion yuan ($330 billion), data from the General Administration of Customs showed on September 8. "In the long term, the yuan's inclusion in the basket would also prompt overseas capital to flow into China on a large scale and cause the domestic capital markets to open up to a greater extent," Zhou said. However, such processes should be gradual and long, Wang Chunying, an official at the State Administration of Foreign Exchange, said at a press conference on Thursday.